If I were to draw a map of the world and place an orca graphic in every sea and ocean where you would find killer whales (Orcinus orca), it would soon become a very busy picture. There are an estimated 50,000 individuals distributed throughout the world's oceans. They are the most widely-ranging of all cetaceans and are considered to be the second-most widely ranging mammal on the planet, after humans. Orca are most commonly found in areas constituting high marine productivity, from the equator through to polar waters. The IUCN Red List of Threatened Species has classified the Orcinus orca species as Data Deficient. This means that there isn't enough research available to suggest a suitable conservation status for orca as a whole species. However, some local populations of orca have been given a different conservation status by country-specific classification systems. Example 1: in the USA the Southern resident community of Puget Sound are listed as endangered under the Endangered Species Act 1973, with all orca listed under the Marine Mammal Protection Act (MMPA) 1972. Example 2: Orca found in NZ waters are classified as Nationally Critical under the New Zealand Threat Classification System. Orca populations found around the world have been observed to differ morphologically, genetically, behaviourally, acoustically and culturally from one another. Some populations also differ geographically, whilst others overlap in their home range. A single population can be divided into several smaller pods and groups. Orca tend to live in complex matriarchal societies comprised of related individuals who typically remain with their families for their entire lives. Based on studies of Northern and Southern resident orca of Washington State and British Columbia, males were found to have an average lifespan of 29.2 years, with a maximum longevity of 50-60 years and females were found to have an average lifespan of 50.2 years, with a maximum longevity of 80-90 years (Olesiuk et al. 1990). Some females, like Southern resident matriarch J2, or 'Granny', are believed to have survived over a whopping 100 years of age! So again with the 'Southern resident' reference! Who are the Southern residents? This blog report will introduce you to orca populations found around the world, as well as to the marine biologists and research projects who study them. 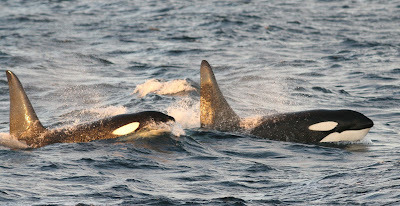 Currently, ten orca ecotypes (distinct forms or races of the orca species) have been recognised. These ecotypes make up the three or four dozen populations that are found inhabiting our World's oceans. 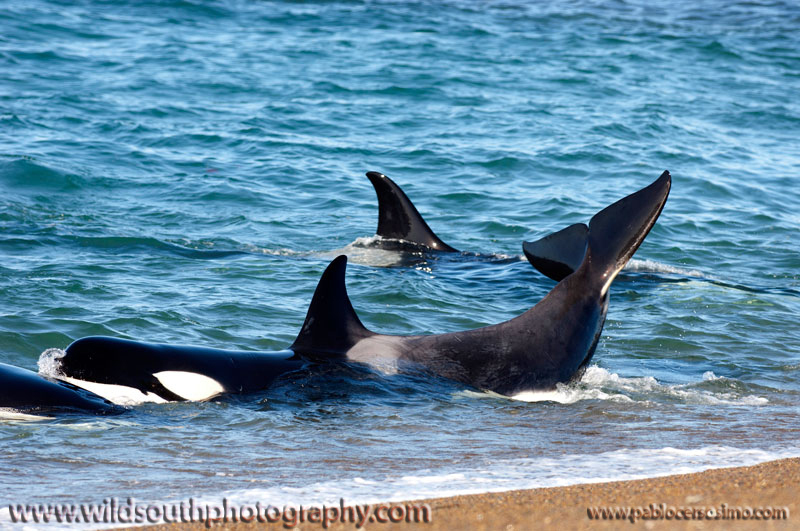 For the purpose of this blog, populations are defined as communities, clans or groups of related orca living in a specific area or geographical region. Populations are identified by ecotype (i.e. there is never more than one ecotype in a population). So please read on and meet the orca of our world. 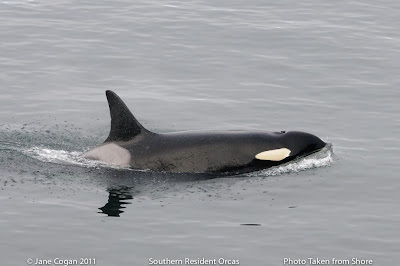 and pelagic OFFSHORE orca, about which little is known today. Resident orca range from as far north as southeast Alaska and have been sighted as far south as California during winter months. 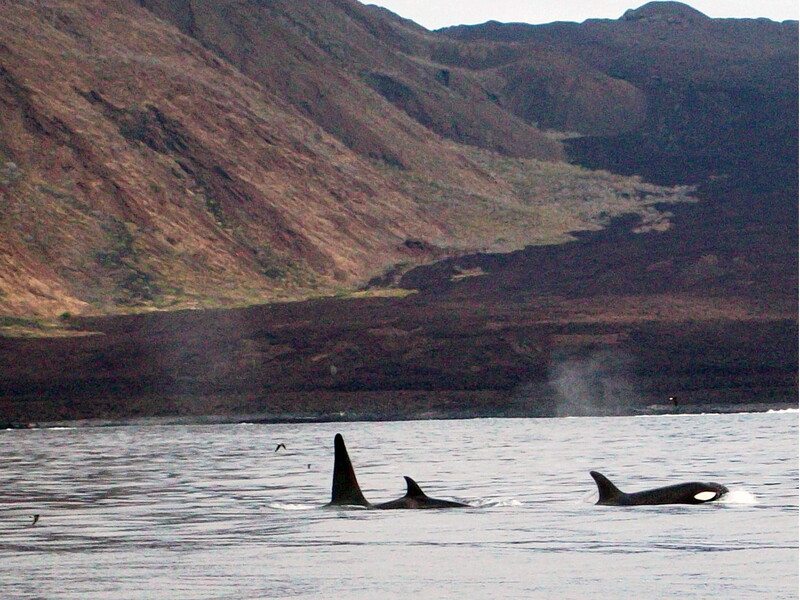 These orca are fish-eaters, specialising in salmon and particularly the high-energy Chinook species. They live in highly complex, matriarchal family units known as matrilines, with sons and daughters remaining with their mother for their entire lives. Resident males tend to live into their 40s, whilst resident females typically live into their 60s. The residents are comprised of two communities - the Northern residents and the Southern residents. During 30+ years of research, these two communities have never been observed in the same place at the same time as each other. For resident orca, clans are the next level of social structure, after community, and contain pods of similar dialect and common (maternal) heritage. Resident pods are formed by several closely related matrilines. They typically travel in groups of 6 - 50 individuals. Both the Northern and Southern residents can be recognised by the blunt tip of their dorsal fins and the saddle patch markings which tend to be either uniformly grey in colour, or grey and black, the latter known as an 'open saddle'. The Southern residents are comprised of one clan (J clan) and three pods: J, K and L. They total 84 individuals at present. During the Summer months, they are typically found in waters off the coast of Victoria and the San Juan Islands and into Georgia Strait. Critically endangered, this community is particularly threatened by a significant reduction in their food supply (the Chinook salmon) as a result of over-fishing and habitat degradation. Toxins and noise pollution from boats are also a conservation concern. Three clans (A, G and R) make up the Northern resident community, consisting of a number of pods and around 250 individuals. 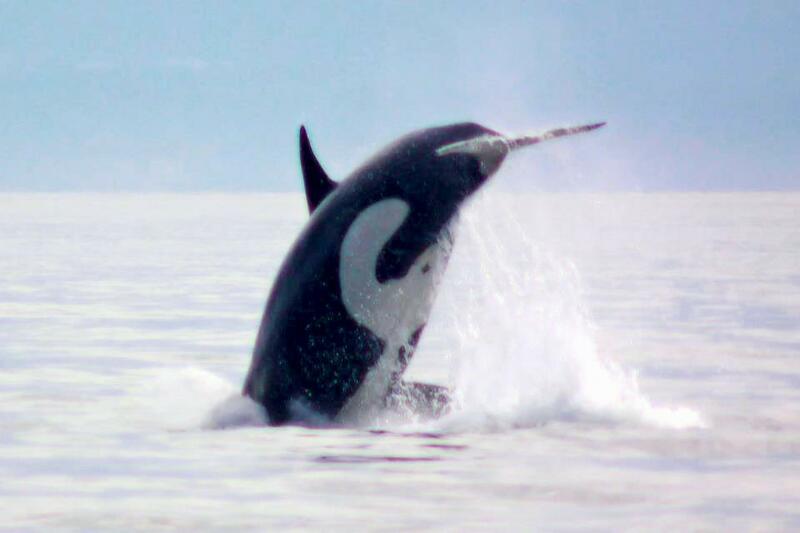 These animals are typically sighted off Vancouver Island and the coast of British Columbia in Canada. During the winter months, they travel up to southeast Alaska. The Northern resident community faces the same threats as the Southern residents, with the added threat of diseases spread from salmon farms. Marine-mammal eating transient orca of the Pacific Northwest travel in smaller, less-stable social groups than the resident orca. These orca range between Mexico and the Bering Sea. Groups tend to consist of 3 or 4 animals (less than 6); usually a mother and a couple of her offspring. 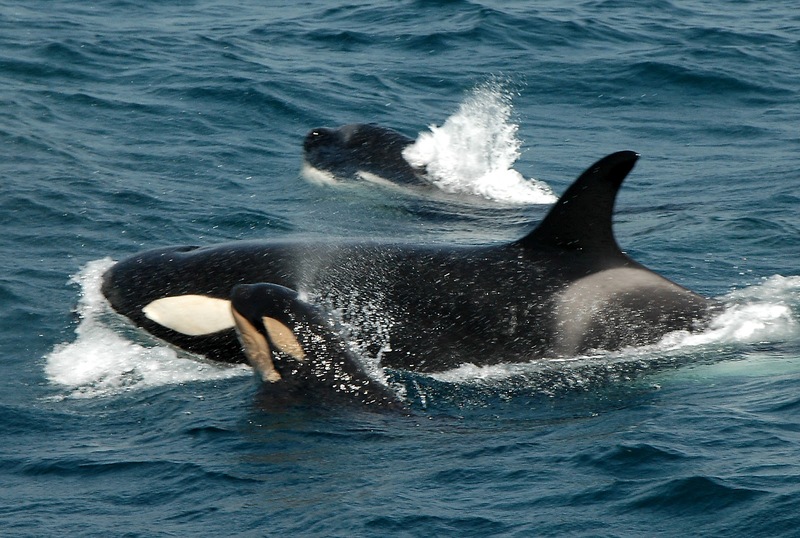 Only first-born transient orca tend to stay with their mother throughout their entire lives. Unlike the resident orca, they hunt silently, but can be extremely vocal whilst feeding. 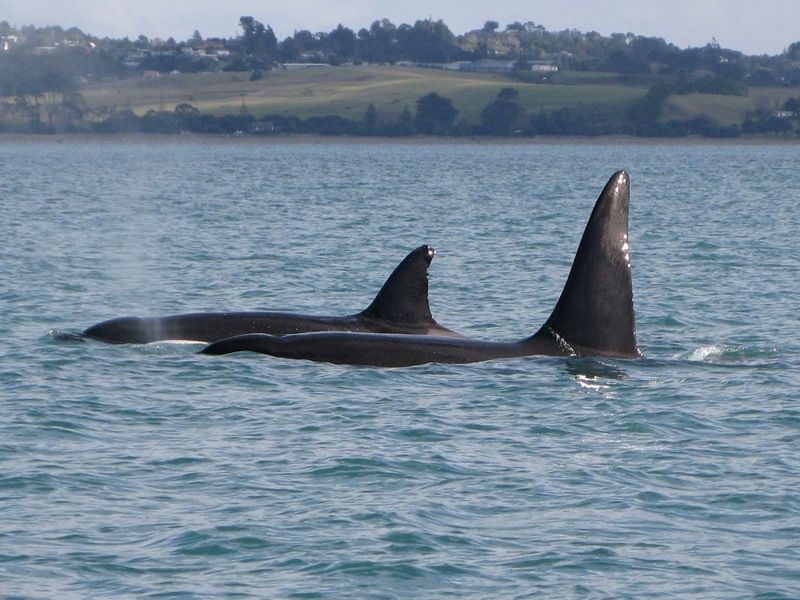 Transients can be recognised by their pointed dorsal fins and large, grey saddle patches. Open saddle patches are never seen in this ecotype. 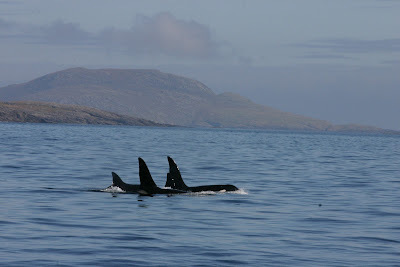 Whilst the range of transient orca overlaps with that of the residents, the two ecotypes do not mix and have even exhibited avoidance behaviour when observed in the same area. Analysis indicates that these orca have not inter-bred for at least 100,000 years. 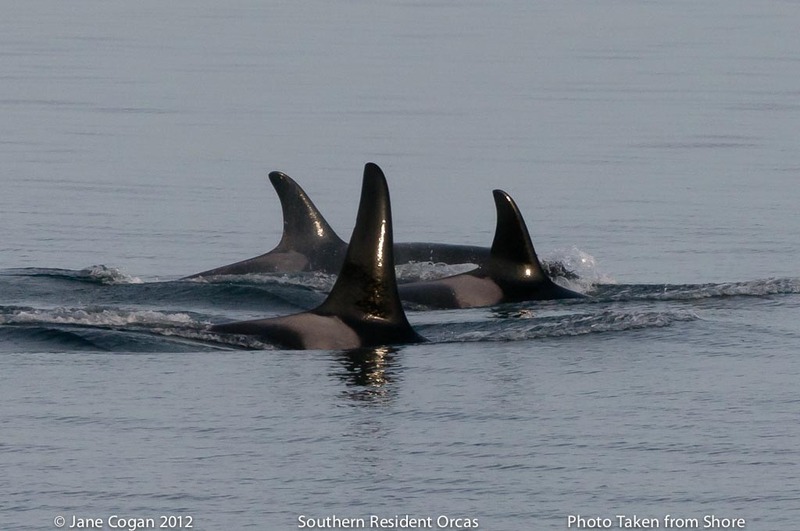 It is possible the transient and resident orca are in the process of becoming a separate species. 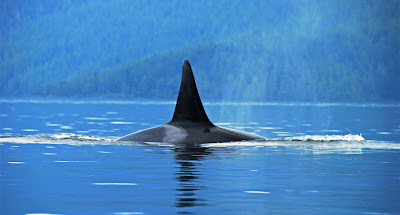 Around 250-300 individuals of offshore orca have been identified. They are typically found in groups of 25+ individuals and are most similar to resident orca both in appearance and genetically. Open saddle patches can occur in this population and the saddle patch size is about the same as that of the residents. These animals are believed to be smaller in body size than both resident and transient orca. It is thought that these orca feed on fish and perhaps sharks. Offshores are thought to have some of the longest movement of any orca. Little else is known about this ecotype. In 1971, Mike Bigg, a marine biologist with the Canadian Department of Fisheries and Oceans' Pacific Biological Station in Nanaimo, British Columbia was asked to determine how many orca remained after seven years of captures for marine parks. On July 27, 1971, Bigg sent 15,000 questionnaires to boaters, lighthouse keepers, fishermen, and others, asking them to record killer whale sightings. The result of the survey indicated that the number of orca in British Columbian waters was at almost 350, far fewer than previously believed. Bigg and his colleagues soon discovered that the dorsal fin and saddle patch area of each orca was sufficiently distinctive to allow the individual to be reliably identified by a photograph. The technique enabled researchers to accurately account for each individual each year rather than estimate their numbers. It also allowed longitudinal studies of individual orca over many years, to document their travel patterns and social relationships, and soon became the method of choice for the study of orca and other cetaceans (whales, dolphins and porpoises) worldwide. 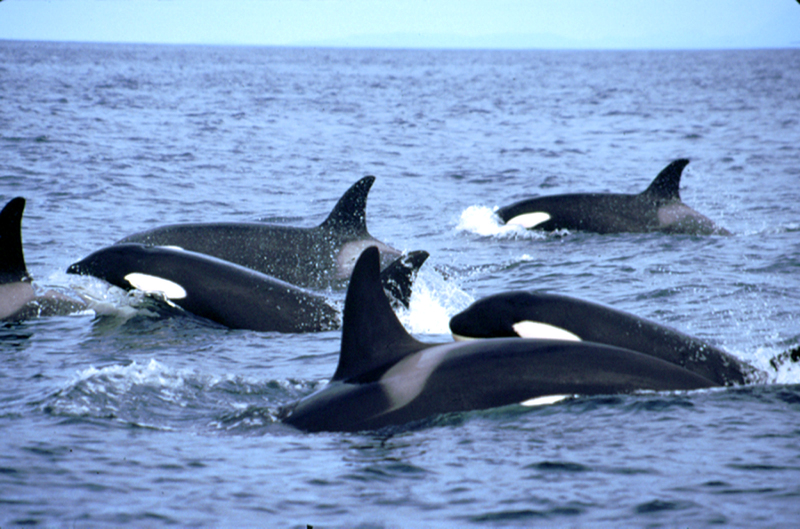 In 1976, 'Orca Survey' was launched as a census to determine the status of the Southern resident orca population. 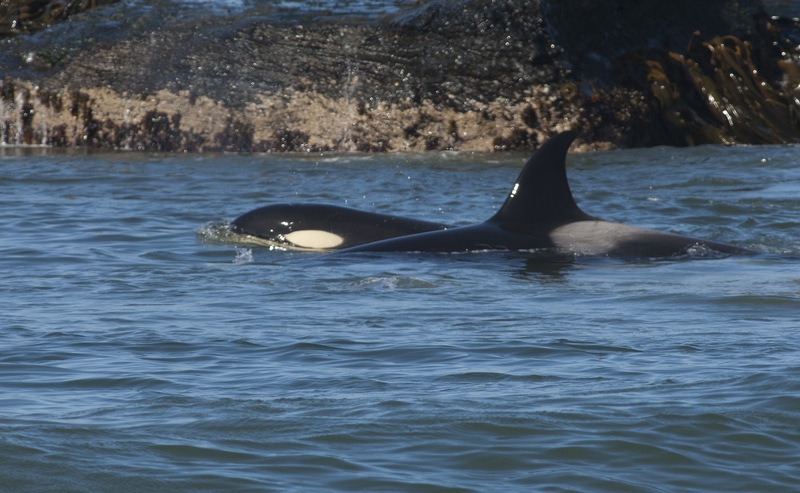 It was initiated by Principal researcher Ken Balcomb to ascertain the size of the orca population in the Greater Puget Sound waters of Washington State and is a long-term photo-identification study. 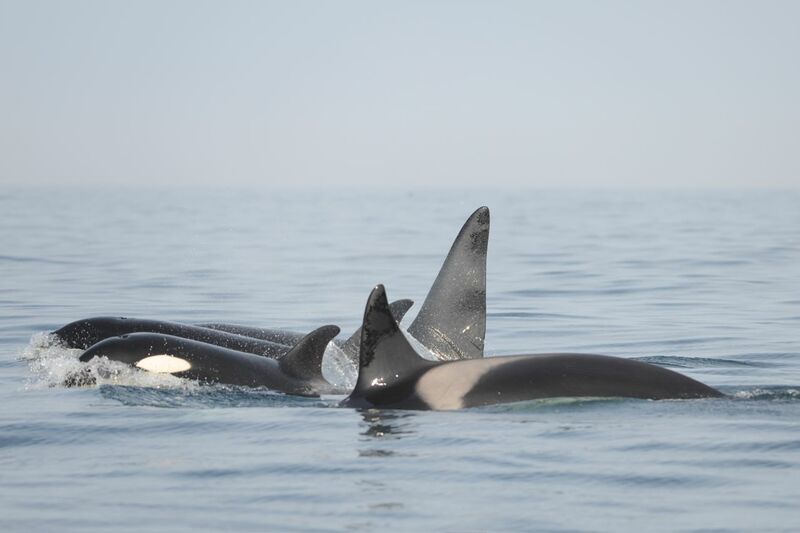 For over three decades the Center for Whale Research (CWR) has been conducting annual photo-identification studies of the Southern resident orca population that frequent the inland waters of Washington State and lower British Columbia. The Orca Network is a non-profit organisation registered in Washington State, dedicated to raising awareness through research and education about the orca of the Pacific Northwest, and the importance of providing them with healthy and safe habitats. It was co-founded in 2001 by Howard Garrett, who began working for the Center for Whale Research in 1981, and Susan Berta. 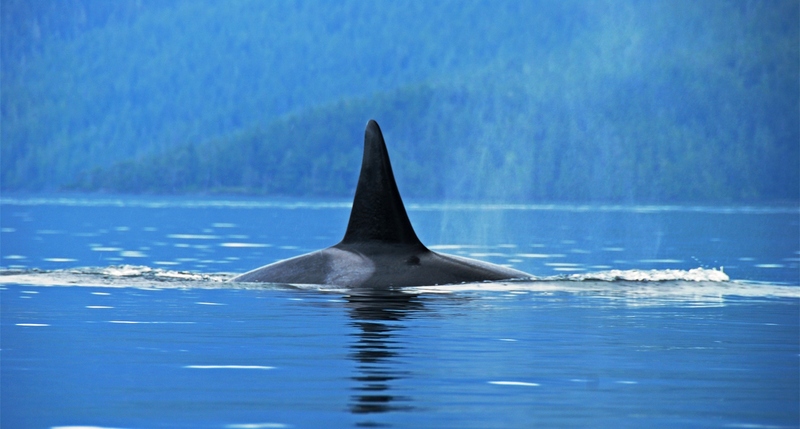 OrcaLab, founded by orca researcher Paul Spong in 1972, is a land-based research centre studying the Northern resident orca of British Columbia. It is located on Hanson Island at Blackney Pass. Their philosophy is research without interference. They have developed a network of remote hydrophone stations which provides acoustic coverage of much of the core habitat of the orca that they study. They monitor these hydrophones continuously. All members of the Northern resident community have been catalogued and OrcaLab are able to identify clans and families from the sounds that they make. The Transient Killer Whale Research Blog was established in 2011 by Josh McInnes, a transient orca ecologist with 14 years worth of experience. It is a non-profit organisation based on Vancouver Island, which researches, photographs and educates about the transient orca of British Columbia. This research is assisted by the tour and charter boat industry and strongly abides by the whale watching guidelines and marine mammal guidelines of Canada. Resident, transient and offshore ecotypes can be found in Alaskan waters. 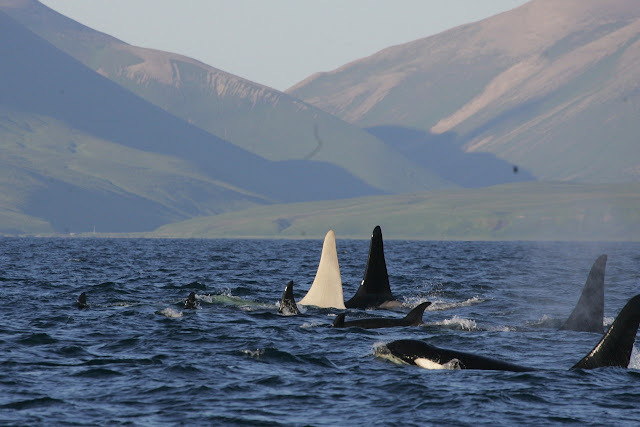 Some areas, such as Prince William Sound, the waters around the Aleutian waters and Bering Sea shelf edge, have some of the highest orca densities that can be found anywhere in the world. Over 2,000 resident ecotypes have been catalogued in these waters which correlates with healthy Alaskan fish stocks. The resident ecotype in Alaska are comprised of two groups, the Southern Alaska residents and the Western Alaska North Pacific residents. 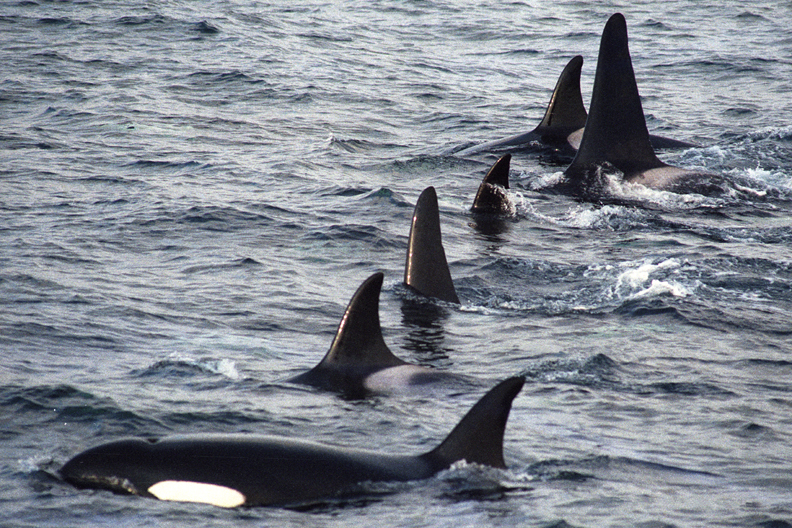 They form social units not unlike the resident orca of the Pacific Northwest. The more distantly related individuals are, the greater the difference in vocal dialect. Resident orca found in the Gulf of Alaska (including the Prince William Sound) show a preference for Chinook and Coho salmon, whereas in western Alaska where salmon are less abundant, the orca feed on other fish species, such as Atka mackerel. Around the Aleutian Islands and the Bering Sea, orca are known to take fish from the longline fisheries. 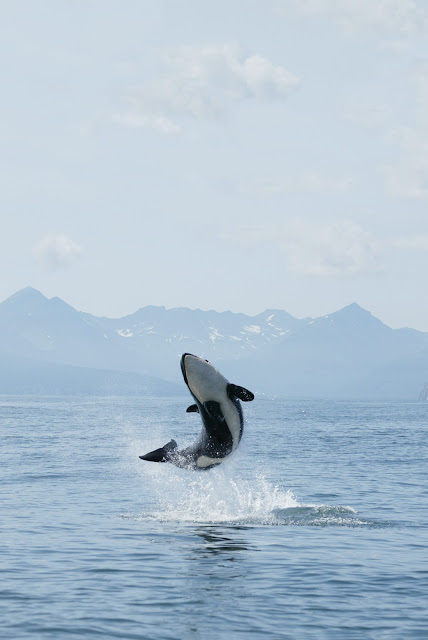 One population of transient orca found in Alaskan waters are known as the Gulf of Alaska (GOA) transients. Less than 100 individuals have been identified. The GOA transients have not been observed to socialise or breed with the AT1 transients, also found in Alaska, a situation unique to this area. They have, however, been seen mixing with the West Coast transient population of southeastern Alaska and northern British Columbia. There are thought to be around 260 West Coast individuals. Like the transient orca of the Pacific Northwest, these Alaskan transients feed on other marine mammals, including large baleen whales. The Exxon Valdez oil spill, which occurred in Prince William Sound in 1989, resulted in the death of some resident and transient pod members, which in turn altered the social structure of these groups. One resident pod, known as 'AB', lost 13 out of 36 individuals. This pod has still not recovered over 20 years later. The transient AT1 group lost 9 out of 22 individuals. This population will likely die out as they have not reproduced since the spill. Offshore orca are encountered less frequently in Alaskan waters in groups of over 100 individuals. They are smaller in size to other orca in these waters and appear to move at faster speeds. These offshore orca have also been sighted in waters around California, Washington State, British Columbia, as well as in the Bering Sea. The Alaska Fisheries Science Center is a research branch of the National Oceanic and Atmospheric Administration's National Marine Fisheries Service. It is responsible for research on living marine resources in the coastal waters off Alaska and parts of the US west coast. Paul Wade of the National Marine Mammal Laboratory division currently leads a field project which started in 2001 studying orca of the Aleutian Islands and Bering Sea. Marilyn Dahlheim, also of the National Marine Mammal Laboratory division, has been studying cetacean biology and ecology since 1989, including the orca of southeast Alaska. The North Gulf Oceanic Society (NGOS) is a federally recognised non-profit research and education organisation. It specialises in long-term marine mammal research studies. Members include scientists and educators who are active in the marine research field and the Society is supported by individuals and foundations that have provided money or resources for their work. One of their primary projects includes a study of the orca population off the coast of Alaska which began in 1977. The NGOS is assisted greatly by the tour and charter boat industry. California marks the southern range of orca from as far north as Alaska and the northern range for orca from the waters off of Mexico and offshore waters of the eastern tropical Pacific. Orca occur year-round here, particularly in the Monterey Bay area, where resident, transient and offshore ecotypes have all been observed. 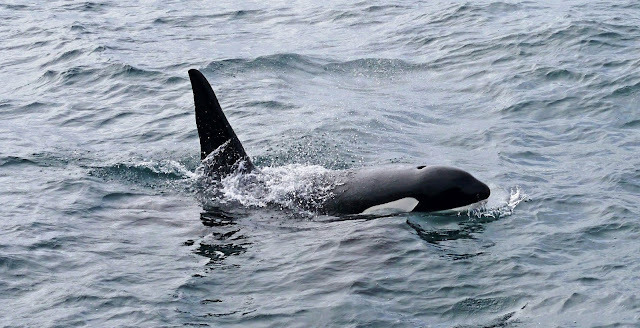 Around 45 individuals have been identified who have not been found to associate with any known type of orca that occur in these waters, some of which look different and are believed to range into deeper, offshore waters. 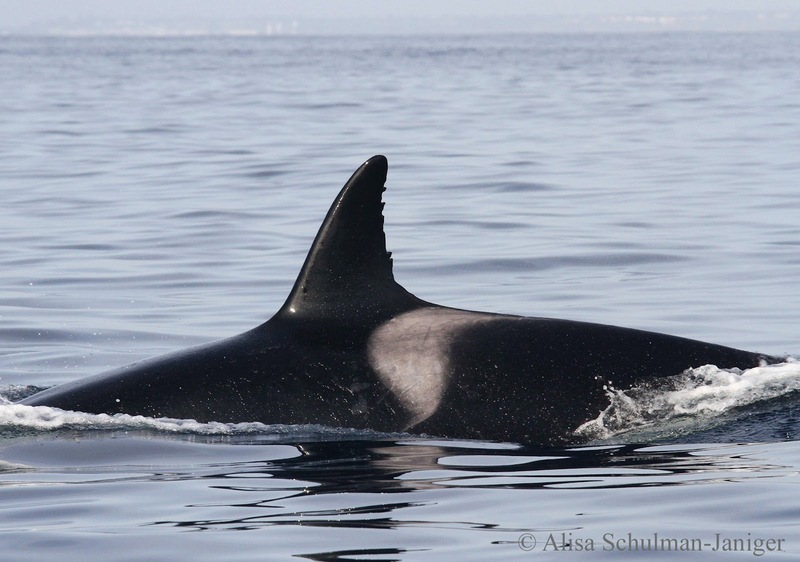 Transient orca are the most frequently sighted in Californian waters, with over 145 individuals identified. They are particularly prevalent during April and May when they hunt grey whale calves. These orca range up to Washington State and as far north as British Columbia and Alaska. 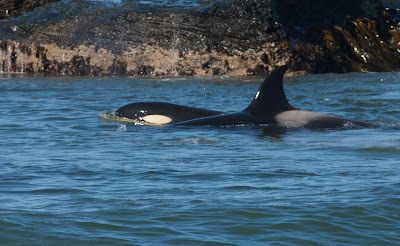 Pacific Northwest Southern resident pods K and L have been travelling as far south as Monterey Bay since the year 2000, where they are observed every winter. It is thought that they may have expanded their range further south into California as a result of the salmon stock decline in the Pacific Northwest. However, Chinook salmon (their preferred prey type) is also under pressure from over-fishing and habitat degradation in Californian waters. 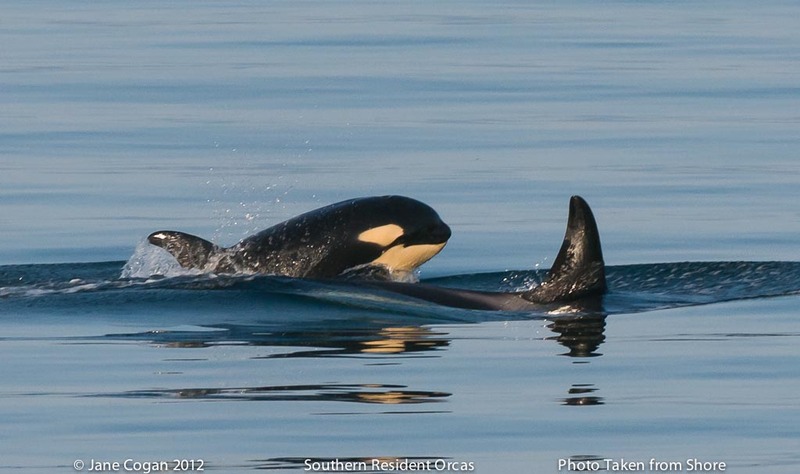 Over 200 offshore orca have been identified in Californian waters. A group known as the LA pod were commonly sighted between 1982 and 1997 in waters off the Los Angeles coastline. Comprised of about 14 individuals, they preyed on sharks and sea lions, with female member CA2 famously observed attacking and killing a great white shark in 1997 off the coast of San Francisco, California. This group were last sighted in 1997 heading south from La Jolla in California. They have not been seen since. It is possible they have altered their range further south into Mexican waters. Orca studies in the Monterey Bay area have been conducted since the 1980s by researcher Nancy Black who, along with other marine biologists, collects data through her whale-watching company based in Monterey Bay, California. The Monterey Bay Whale Watch research team hold the orca catalogue for California and are currently continuing with their photo-identification, behaviour and social studies on orca in Californian waters. Around 600 orca can be found off the Kamchatka coast in the far east of Russia. An additional 960 individuals have been identified in the waters around the Commander Islands, which are located 175km east of the Kamchatka peninsula. The orca here tend to travel over quite wide ranges, in stable, matrilineal groups. These orca are highly vocal fish-eaters. Main prey types for these orca include salmon species and Atka mackerel. 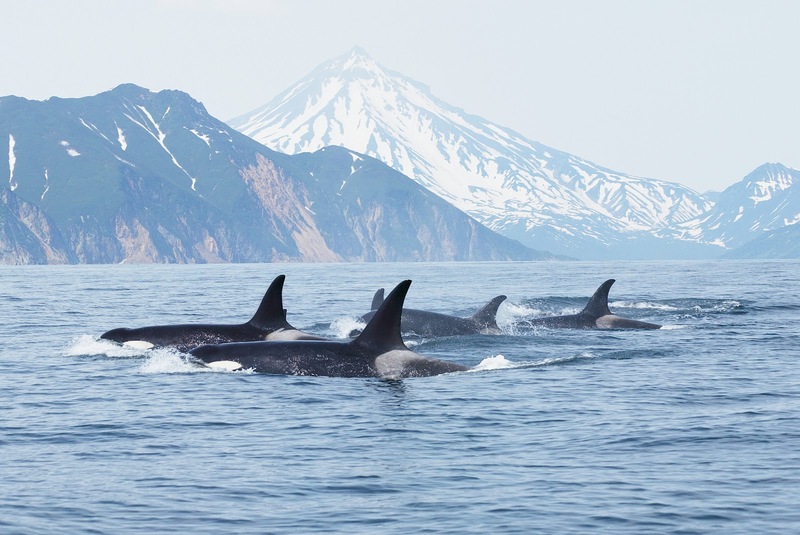 Three resident acoustic clans, the Avacha, K19 and K20 clans, have been identified for orca in eastern Kamchatka, although other matrilines with unknown dialects can be found in these waters. All three clans visit the Avacha Gulf during the summer months. Each matriline differs in patterns of area usage The Avacha clan is the most studied clan and the largest of the three, consisting of 160 orca. Occasionally, mammal-eating orca can be encountered in the Avacha Gulf. Both ecotypes encountered off the coast of Kamchatka can be seen far from shore as well as inshore. The two ecotypes (fish-eaters and marine mammal-eaters) do not mix with each other and are thought to be two separate populations. The fish-eaters exhibit several foraging behaviours, including one where they round-up the fish and dive into the centre of the school, one at a time, to feed. 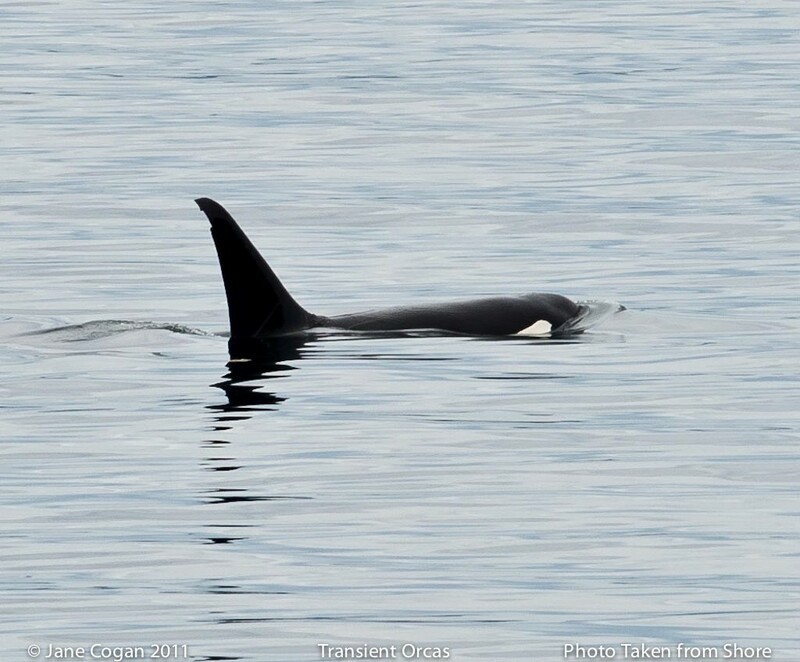 These resident (fish-eating) orca are very similar to the residents of the Pacific Northwest in colouration patterns and dorsal fin shapes. One study found that there were no differences in saddle patch colouration between the Kamchatka, Alaska and Northern resident communities. The Far East Russia Orca Project (FEROP) was started in 1999 as a collaboration between Russian institutions and Whale & Dolphin Conservation (WDC) to help build a future for orca research and conservation in Russia. This continuing long-term study has been co-funded by Humane Society International, Animal Welfare Institute, the Rufford Foundation and other groups. Little is known about the orca found in Japanese waters. They are still at risk from whaling in Japan, with small numbers being taken by the Japanese coastal fisheries every year. Orca are also at risk from whaling in Greenland, Indonesia and the Caribbean islands. Very little is known about the orca that are sighted off Sri Lanka's shores each year. With only a handful of annual encounters, many questions surround this secretive population. An opportunity to study these orca has recently emerged due to a recent surge in whale-watching tourism. Currently, 11 individuals have been identified, with some known to travel all around the island. 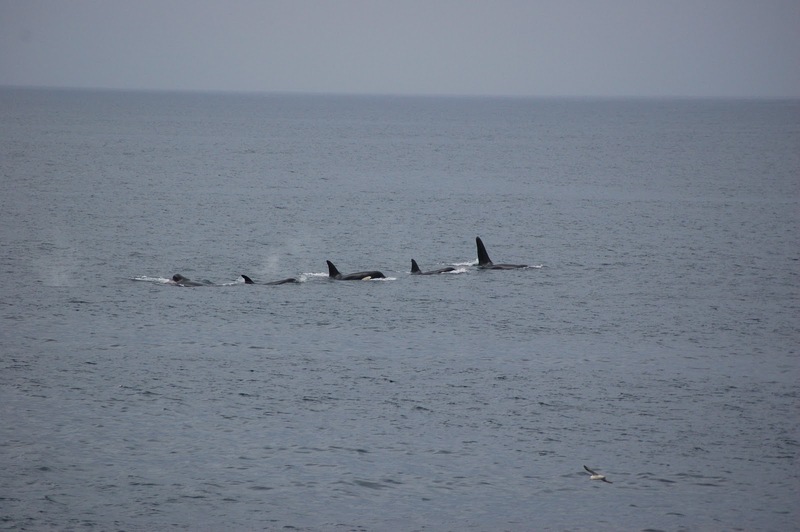 Re-sightings have revealed that some of the orca return to the island each year. Orca sightings are highest in January, December, as well as March to April, which coincides with the blue and sperm whale season. 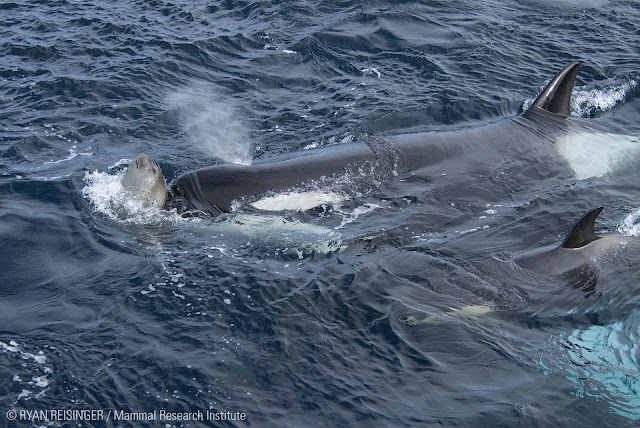 These orca prey on marine mammals, although it is not known whether they feed on other prey-types as well. It is thought that populations inhabiting the tropics may be less likely to exhibit prey specialisation and that they may have a more varied diet than orca found in cooler and temperate waters. 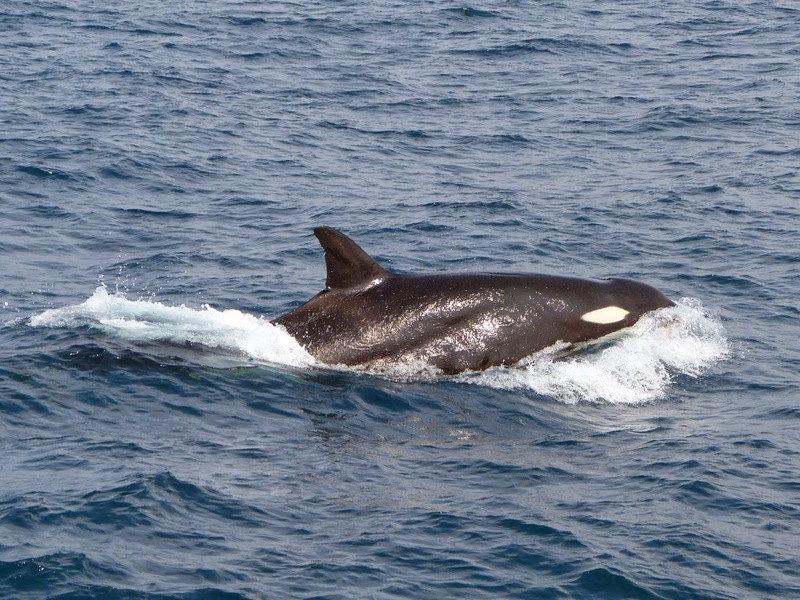 Orca Project Sri Lanka (OPSL) is the first citizen-science project to study orca sighted off the coast of Sri Lanka. In addition to a sightings log, images submitted by the public are used as part of an on-going photo-identification study. The Maldives is located 700km south-west of Sri Lanka and 400km south-west of India. The Chagos Islands lay 500km south of the Maldives in the Indian Ocean. Orca have been sighted in these waters but are not common. It is thought that they prey on fish and possibly elasmobranchs (sharks and rays) and orca in these waters have also been observed hunting bottlenose dolphins. Reports suggest that they interact with the tuna fisheries off the coasts of both the Maldives and Chagos Islands. Little else is known about these orca. Two killer whale groups (seal-hunting and fish-eating) are found off the north east coast of Scotland during summer months. Seal-hunting groups have been observed in inshore waters of Shetland, Orkney and Caithness, whilst fish-eaters have only been observed only off the Shetland coast. They may, however, be more wide-ranging. Around 38 individuals have been recorded and have also been sighted off south east Iceland, the Faroe Islands, St. Kilda and North Rona. Whilst both fish-eating and mammal-eating killer whales occur in UK waters, the degree of dietary specialisation remains unknown. 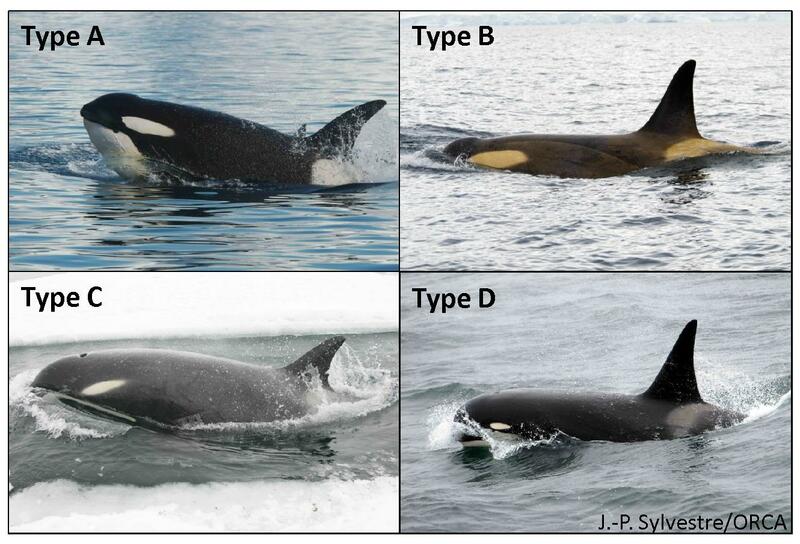 A recent study has suggested that these two groups of orca may be two distinct ecotypes, type 1 and type 2. 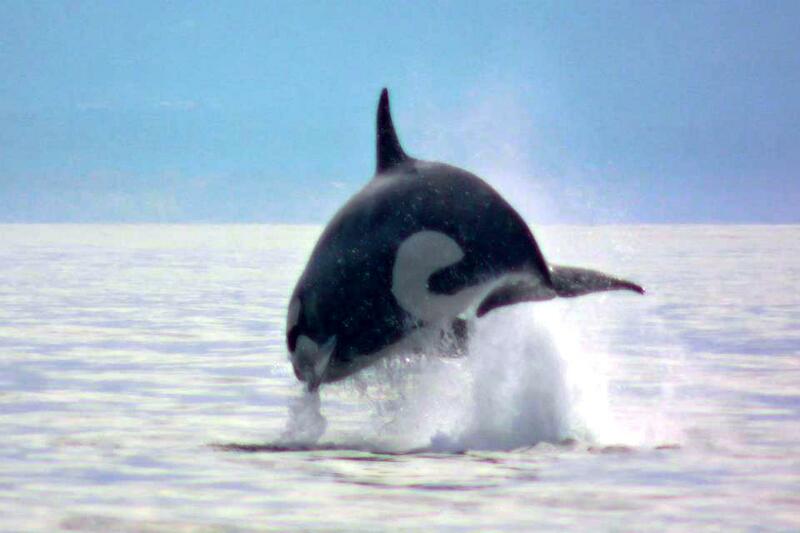 Type 1 orca are thought to prey on fish (such as herring and mackerel) and seals. These 'generalist' feeders tend to have a lot of tooth wear. Their eye patches have a parallel orientation, extending as far back as the blowhole. Type 2 orca are 'specialist' feeders, preying on whales and dolphins. Unlike the type 1 orca, they have relatively little tooth wear. 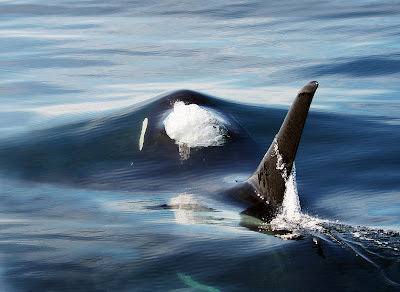 These animals grow to a longer length than the type 1 orca and their eye patches have an angular orientation, with the blowhole in front of the anterior end. The type 2 orca are more closely related to type A Antarctic orca. 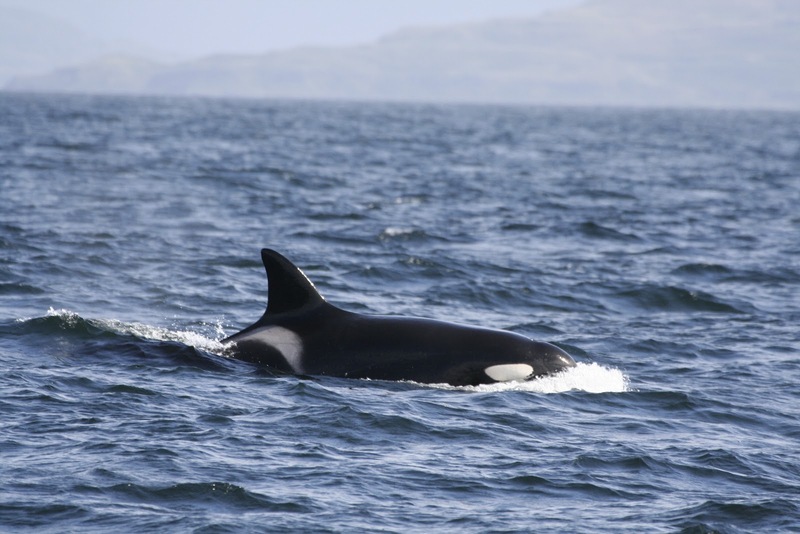 Other prey items that orca found off the north east Scottish coast have been observed hunting include harbour and grey seals, eider ducks and river otters. During the month of October, orca are often sighted in large numbers (up to 200 individuals), feeding on mackerel around pelagic trawlers in the North Sea. It is thought that there are several hundred members of this population. It is possible that they follow the mackerel migration all year round. Using ultrasonic frequencies, the Shetland herring-eating orca produce whistles which are out of the range of human hearing. A second group of orca can be found on the north west coast of Scotland around the Hebrides. This unusually small population consists of less than 10 individuals. Dubbed the 'West Coast Community', they have quite a large range, with individuals sighted throughout the Hebrides and as far south as north west Ireland and south Wales. Regularly sighted since 1992, male orca 'John Coe' has been sighted off the coast of County Donegal, Ireland and has been seen multiple times off the Pembrokeshire coast, Wales. There is little data which suggests what these orca feed on, but there has been one report of individuals feeding on a harbour porpoise. So far, there have been no photo-identification matches between the Hebridean orca and those found in waters around Iceland, Norway and the north east coast of Scotland. The small size of this population and the lack of new calves being born make this population highly vulnerable. These orca may be at high risk from PCB contamination, which has the potential to affect the reproductive capabilities of these animals. Apex predators of the ocean, orca are vulnerable to bio-accumulation of toxins from all other species on the food chain beneath them. PCBs are stored in fatty tissue and when females reproduce, these toxins are 'dumped' onto the offspring through the fatty milk produced for nursing. A connection has also been found between PCB levels and reduced killer whale fertility, and the toxins can also affect immunity against disease and infection. Other orca populations around the world are also at risk from and are thought to have been negatively impacted by PCB contamination. Other conservation concerns for North Atlantic orca include noise pollution and contamination from other toxins and pollutants. Project NAKID (North Atlantic Killer Whale ID) aims to bring studies of North Atlantic orca together by collating data from each area. 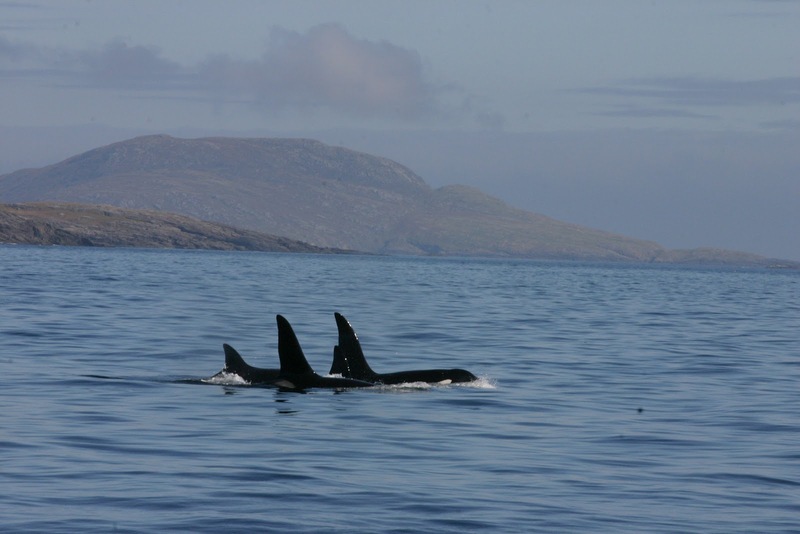 They are developing a library of photo-identification, genetic and acoustic data on North-East Atlantic orca in order to study population structure and facilitate comparative studies between populations. Long-term studies have been conducted off Norway and Iceland and research has recently begun around the coast of Scotland. Established in 1994, the Hebridean Whale and Dolphin Trust (HWDT) is a registered charity that has pioneered practical, locally-based education and monitoring programmes on cetaceans in the Hebrides. The HWDT is based in Tobermory on the Isle of Mull. 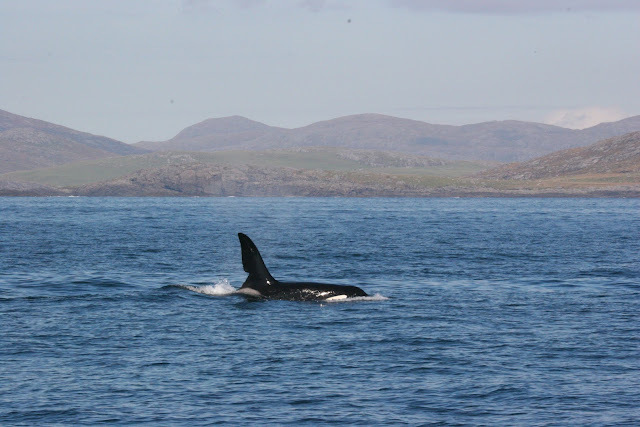 They conduct long-term monitoring of distribution, abundance and habitat use of the cetaceans in Hebridean waters, including orca. The aim of the Trust is to provide information needed to achieve effective conservation in the area. 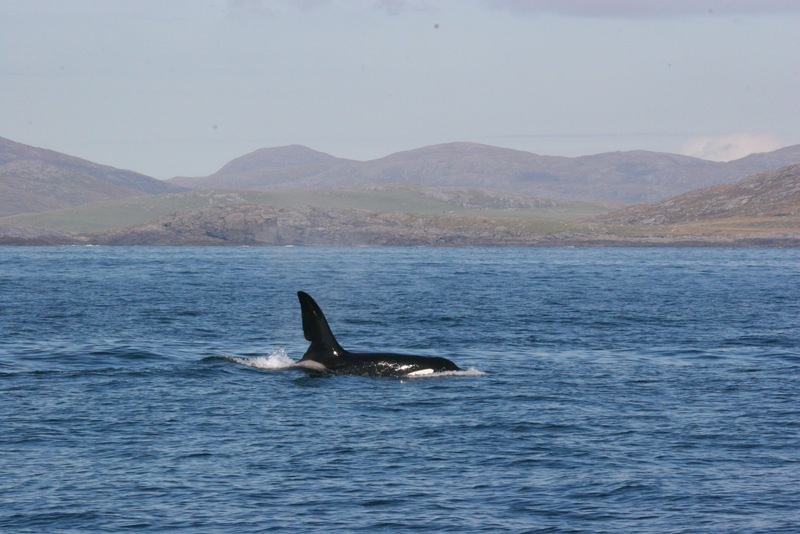 They currently hold the photo-identification catalogue of the West Coast Community orca found in Hebridean waters along the west coast of Scotland. Founded in 1990, the Irish Whale and Dolphin Group (IWDG) is dedicated to the conservation and better understanding of cetaceans in Irish waters and their habitats through research and education. The IWDG is comprised of conservationists, researchers, educators, whale-watchers and anyone else who shares a passion in the conservation of marine wildlife. Studies on Icelandic orca began in the 1980s in east Iceland, where the orca could be found following the Icelandic summer-spawning herring winter migration. 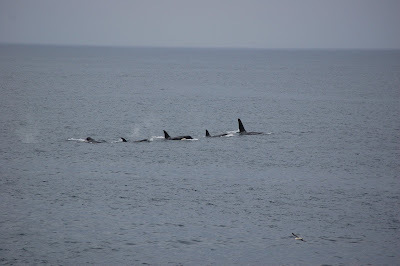 A total of 123 orca have been recorded off Vestmannaeyjar, although actual numbers are likely to be higher. It has been suggested that the Icelandic orca have a similar group structure to other fish-eating populations found around the world: highly complex, matrilinial, family groups. 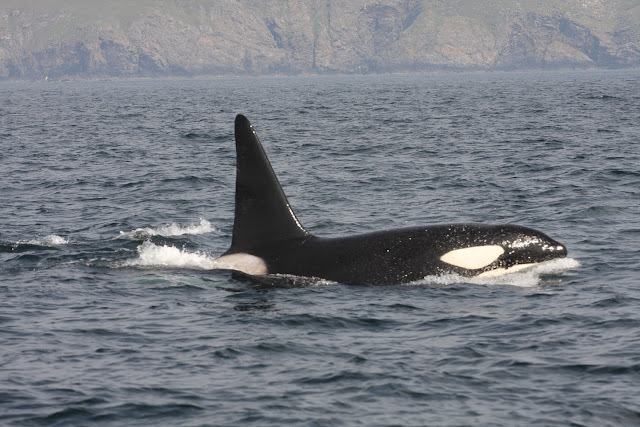 Using ultrasonic frequencies, like the Shetland herring-eating orca, Icelandic orca also produce whistles which are out of the range of human hearing. Project NAKID started in Vestmannaeyjar, Iceland in 2007. Research focuses on photo-identification and acoustic studies. 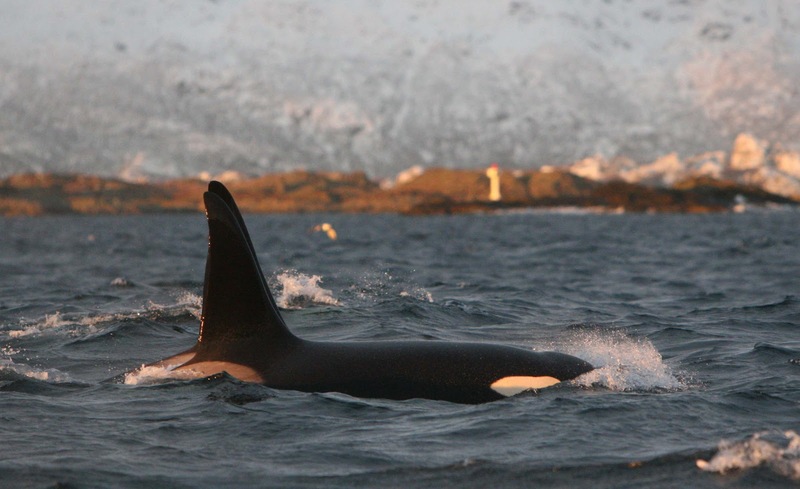 Around 600 orca have been identified in Norwegian waters. Herring-eaters, the orca follow the Norwegian spring-spawning herring into Vestfjord and adjoining Lofoten fjords during the winter months (Oct-Jan), although the herring have recently changed their migration patterns and now winter in the open ocean, outside of the fjord system. The orca herd schools of herring into tight balls, stunning the fish with tail-slaps so that they are able to pick out individual prey items. 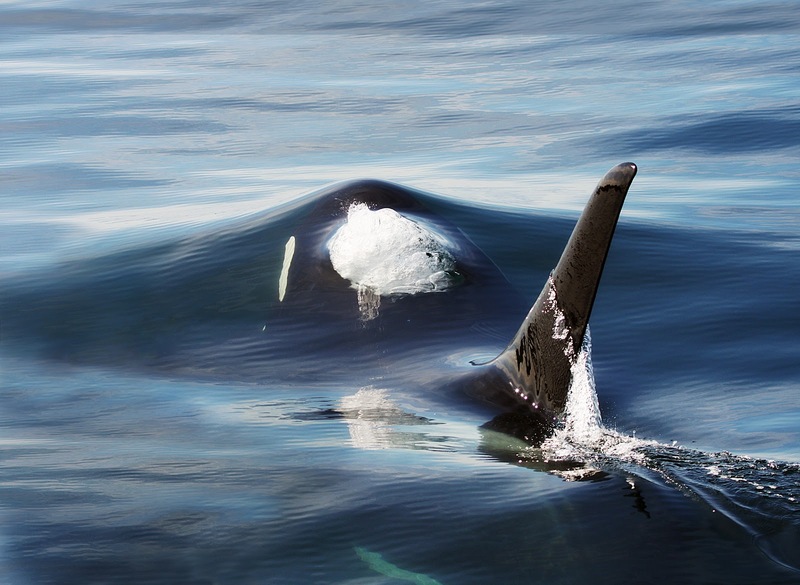 Norwegian orca also use ultrasonic frequencies, which produce whistles that are out of range of human hearing. 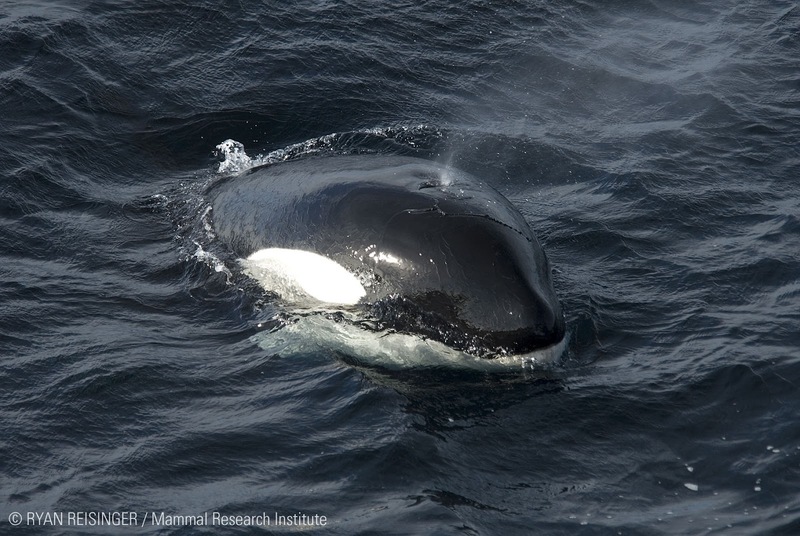 Established in 1987, the Norwegian orca project (NORCA) consists of a network of scientists who are working on different aspects of behavioural ecology and population dynamics of orca in Norwegian waters. 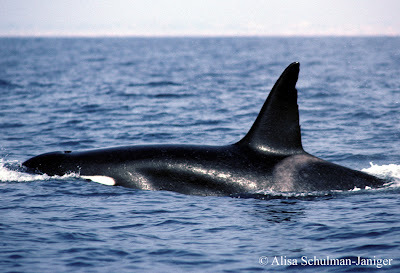 Orca sightings have been described in the Strait of Gibraltar for at least 2000 years. Today, they are often seen with the tuna fisheries. The orca have two tuna feeding strategies: exhausting the fish with a 30 minute chase and interacting with the longline fisheries, the latter of which they have done since the early 90s. This population are threatened by a reduction in food source by the fisheries. Conservation, Information and Study on Cetaceans (CIRCE) was born from the initiative of students, researchers, professors and communication experts with the objective to create a platform that would allow the development of quality research, conservation and education. CIRCE have been studying orca in the Strait of Gibraltar for the past decade. The Foundation for Information and Research on Marine Mammals (FIRMM) was created in 1998 as a platform for whale watching and opportunistic research. The main purpose was to combine whale watching with the creation of awareness through education, with introductory talks previous to the trips and educational courses spanning over one and two weeks. Orca have been sighted around much of the coast of South America, including in waters around Mexico, Costa Rica, Ecuador, the Galapagos Islands, Chile, Argentina Uruguay, Brazil, the Falkland Islands and South Georgia Island. Orca are regular visitors to the Galapagos Archipelago, a province of Ecuador located 973km off the west coast of South America. They are present all year round and have been sighted close to almost every island in the archipelago, but are unpredictable in their movements and distribution. The whales seem to travel continuously and there are no reports of pods remaining in any one location for more than a few hours at a time. Orca are sighted both along the shoreline of the islands and in the deep waters off the edge of the basaltic Galapagos Platform. They are also known to swim into enclosed bays and very shallow water, presumably in search of prey. Pod size is variable, but pods rarely number more than ten individuals, with an average of 3.11 members in inshore groups and larger offshore pods averaging 5.08. Solo animals are also common, particularly close to shore where they make up 50% of sightings. Although little focused research has been done to study the identity, range, or prey of the Galapagos population, data has been gathered on orca in the Galapagos since the 1990s and observations of behaviour made during sightings has allowed some generalizations to be made. Orca in the Galapagos are believed to be generalist hunters, feeding on a wide range of prey species. They have been observed preying on sea lion pups and are frequently seen in the vicinity of large sea lion colonies e.g. Plazas (Santa Cruz), Gardner Bay (Española), Punta Cormorán (Floreana), Puerto Egas (Santiago), and the Canal de Bolívar between Fernandina and Isabela islands; they have also been sighted in close proximity to various species of freshly killed fish, sharks, rays, turtles, seals, sea lions, dolphins and whales, some of which displayed rake marks suggesting that they had been predated by orca. There is still a great deal to learn about the orca that frequent the waters of the Galapagos. In some respects they appear to resemble the transients of the Pacific Northwest, with small social groupings and consumption of marine mammals, however sightings are beginning to suggest that at least some of the whales may be resident in ecotype. Researchers are only now beginning to build a photo-identification catalogue of orca dorsal fins, which will enable them to record sightings of individual whales within the Galapagos Archipelago and gain a clearer picture of this population. Godfrey Merlen began gathering data on orca in the Galapagos during the 1990s and he is now collaborating with the Galapagos National Park (Eduardo Espinosa) in keeping up the records of this species (and other species of whales). Little is known about orca in Brazilian waters. However, they have been reported interacting with the tuna and swordfish longline fisheries between the months of June and February and are most commonly observed doing this between the months of June and October. Individuals have also been sighted feeding on franciscana dolphins, Burmeirter's porpoises, stingray species including eagle rays, several Cephalopod species (squid) and weak fish. 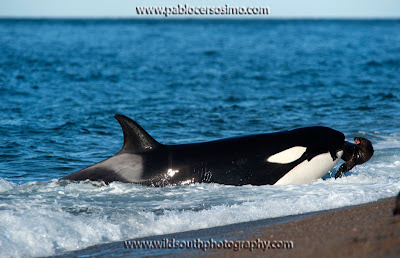 The orca found in Argentinian waters frequent the coastline of Punta Norte between February and April, coinciding with the Southern sea lion pupping season. Pups are born at the beginning of the year and usually learn to swim after only a few weeks. The orca hunt these naive pups by stalking their prey and purposefully beaching themselves in the shallows, as they chase the pups into shore. Orca can be sighted during other months of the year, but this is irregular. The orca in these waters also feed on sharks, fish and other prey items. They are known to travel at least 150km away from the Punta Norte shoreline. A total of 18 individuals are recorded in the Punta Norte Orca Research identification catalogue (2008-2009). Punta Norte Orca Research is a non-profit international organisation based on the Peninsula Valdés, Chubut, Argentina. Their mission is to scientifically study and better understand the population of orca in that area, including their distribution and foraging techniques. 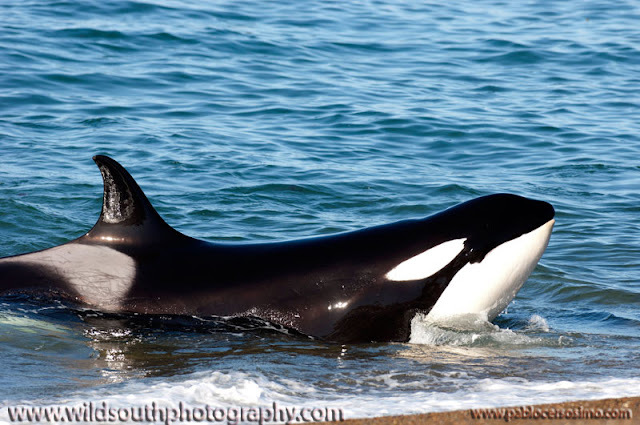 They seek to educate the public about these orca and their environment. 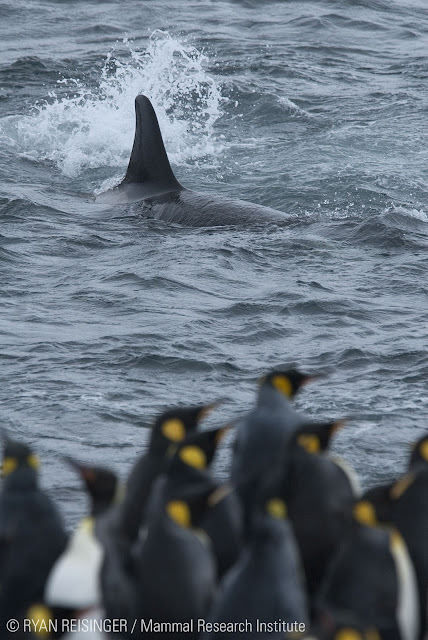 The waters around the Falkland Islands, located 460km off the east coast of mainland South America, are home to at least one resident pod of orca. This pod is commonly sighted in coastal waters to the southeast of the archipelago around Sea Lion Island and Beauchene Island during the summer months, when penguins and pinnipeds (seals and sea lions) are breeding. 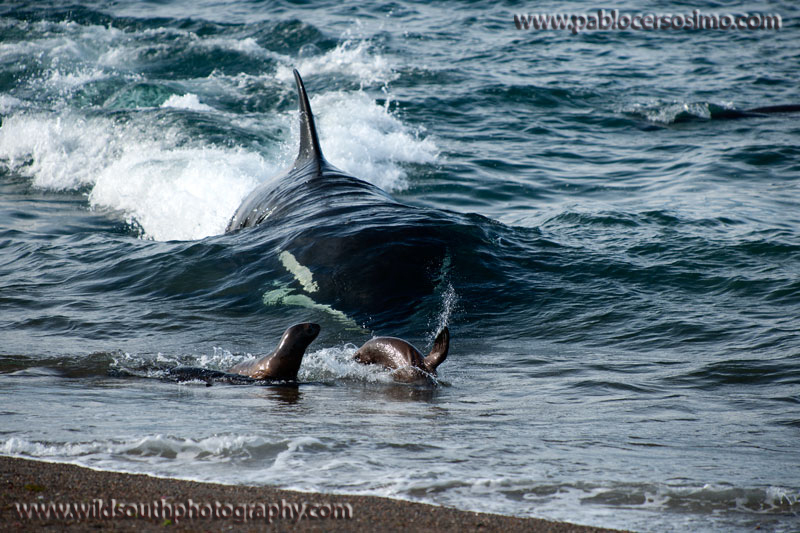 The orca hunt elephant seal pups and juveniles by ambushing them in shallow water along beaches and rocky outcrops. Type A, B and D Antarctic orca ecotypes have also been sighted in these waters. It is believed that they may travel up from Antarctica to warmer waters in order to moult their skin. Further research is needed to confirm where these orca come from and better understand how often they pass through Falkland waters and why. South Georgia Island is located in the South Atlantic Ocean about 1,300km east-south-east of the Falkland Islands. Orca have been found to occur in these waters mainly at Bird Island, off the north-west tip of South Georgia, during the summer months. This coincides with the Antarctic fur seal, as well as macaroni, gentoo and King penguin breeding season. Orca in these waters have also been recorded as interacting with the Patagonian toothfish longline fisheries. Smaller groups consisting of between two and eight individuals have been most commonly seen during these interactions, although solitary animals and larger groups, consisting of 15 or more animals, are not unknown. It has been observed that orca are selective with the species that they remove from the longlines. The subantarctic Prince Edward Islands are comprised of Prince Edward Island and the larger Marion Island, which are situated some 2,000 km south east of Cape Town, South Africa, in the Southern Indian Ocean. The nearest land is the Crozet Archipelago, 1,000 km to the east. Killer whales occur year round at Marion Island, but they are most abundant inshore from October-December and April-May, linked to the breeding seasons of southern elephant seals, fur seals and various penguins. Killer whales are frequently seen extremely close to shore where they prey on southern elephant seals (Mirounga leonina), subantarctic fur seals, King penguins, rockhopper penguins and macaroni penguins. About 45 animals (including 7 calves born in the last 5 years) frequent the island, typically in small groups (3-4 animals). Seven of these animals also occur at the Crozet Archipelago. Morphologically the animals seem to have characteristics of various Antarctic killer whale morphotypes. Little is known of the animals’ movements or diet in the periods they are not at the island. Research on killer whales has been conducted sporadically and opportunistically since the 1970s but a long-term research project, based mainly on individual photographic identification, was initiated in 2006 by the University of Pretoria’s (South Africa) Mammal Research Institute (MRI). Recently the MRI has started more in-depth investigations of the whales’ social structure, genetics, offshore movement and diet. The subantarctic Crozet Archipelago is located in the southern Indian Ocean, in a south-easterly direction from the South African coast. Orca occur year-round here but are more abundant during the elephant seal breeding season, between the months of October and December. Individual orca in this region have been observed feeding on a broad range of prey types, including fish, seals, other cetaceans and penguins. Some pods are also known to take fish from the longline fisheries. Two types of orca totalling around 100 individuals have been catalogued by photo-identification studies. At least 16 individuals, thought to be the subantarctic type D ecotype, have been repeatedly sighted in waters around the Crozet Islands, interacting with the longline fisheries. This morphotype has a small eye patch and a bulbous head. 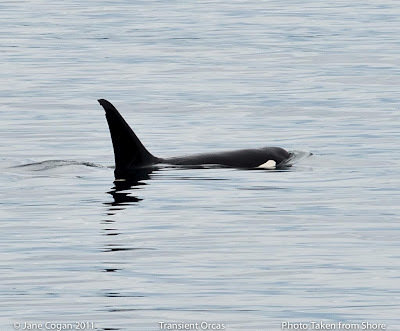 These orca do not interact with the most common ecotype observed in Crozet waters. This common ecotype has a normal-sized eye patch and is comprised of about 85 individuals. A certain level of behaviour and dietary specialisation has been observed within this common ecotype, with different pods exhibiting different behaviour toward the fishery. 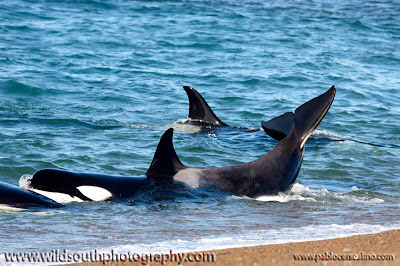 Some Crozet orca use an intentional stranding hunting technique to capture elephant seal pups, a method unique to these individuals in this area. Orca sighted in waters around the Crozet Islands have also been reported off the coast of Marion Island (east of the Crozets) and the Kerguelen Archipelago in the southern Indian Ocean. The Crozet orca are currently recovering from a population decline caused by a shortage of natural prey in the area. This may have been impacted over the last few decades by a decline in the elephant seal population (reasons unknown), illegal fishing and the whaling industry by the removal of baleen whale prey types. Patagonian toothfish poachers are also thought to have actively killed individuals during the 1990s, which likely impacted the social organisation of Crozet orca. Orca in Australian waters are most commonly sighted off the coast of southeast Australia, subantarctic Macquarie Island and the Australian Antarctic Territory. There have however been confirmed sightings of orca off the coast of northern Australia. Orca observed off mainland Australia and Macquarie Island share similar morphological features with type A and type C Antarctic orca. Whilst the degree of dietary specialisation in Australian orca is largely unknown, prey preference appears to strongly determine the distribution and occurrence of orca in Australian waters. For example, orca off central and southern coasts of mainland Australia tend to prey on other cetaceans, including large baleen whales, and pelagic fish, as well as interacting with the longline fisheries, whereas preferred prey-types off the coast of Macquarie Island include pinniped (seal) and penguin species (including King, royal and gentoo penguins). A seasonal trend in sightings indicates that these orca may be migratory visitors to Australian territorial waters, occurring during times of prey aggregation (such as during prey breeding season). For example, orca are more commonly sighted off the coast of Macquarie Island during the austral spring and summer months, between September and December, which coincides with seal pup breeding seasons of some of their preferred pinniped prey-types (southern elephant seals, as well as New Zealand, subantarctic and Antarctic fur seals). Group size tends to range between one and 100, with an average of four individuals per group and is typically a reflection of preferred prey-type (i.e. larger groups hunt fish and smaller groups specialise in marine mammals). It is thought that multiple distinct populations may exist here. Founded in 2009, the Australian Orca Database (AOD), formally known as the Southern Ocean Orca Database (SOOD) which was established in 1994, aims to build a better understanding of orca found in Australian waters. Orca in these waters are transient in nature and so the AOD relies on sightings information and photographs provided by the charter boat industry, fishing community and general public. Tasmania is an island located 240km to the south of the Australian continent, separated from mainland Australia by Bass Strait. Orca have been sighted around much of the Tasmanian coastline. Records suggest that they interact with offshore fisheries and some observations have reported intentional semi-stranding behaviour, which is thought to be a technique used to catch inshore fish. There are also two accounts of orca attacking sperm whales off the coast of Tasmiania. Little else is known about these individuals. There are approximately 200 individuals in the New Zeland (NZ) orca population and it is thought that they are divided into three sub-populations. They can be found around both the North and South Islands in group sizes typically consisting of between 3-12 animals. There have been both strong and weak associations observed between individuals, suggesting that the orca form small, stable groups but that interaction is not limited to these groups. They show a food-preference for stingrays but have also been observed to prey on sharks, other cetaceans and fin-fish (which they have been known to take from longline fisheries). They have never been recorded as feeding on pinnipeds (seals). 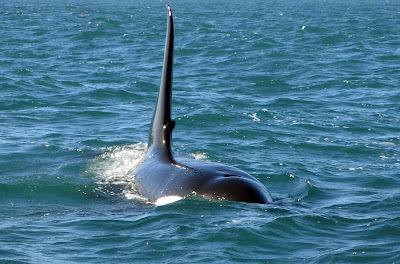 No where in the world do orca come in so close to shore to hunt for stingrays as the NZ orca. They are often seen in less than 1 metre of water and have even been known to accidentally strand as a result. The NZ orca are particularly vulnerable to PCB contamination and other bio-accumulating pollutants, as well as habitat disturbance. Ingrid Visser established the Orca Research Trust when she officially began her studies of the New Zealand orca in 1992. Since then she has worked with orca not only around New Zealand, but also in the waters of Antarctica, Argentina (where Ingrid is director of Punta Norte Orca Research) and Papua New Guinea. The Trust's mission statement is "to protect orca and their habitat, through conservation, education and scientific research". Very little is known about the orca of Papua New Guinea (PNG). A total of 14 individuals have been catalogued by photo-identification and it is thought that they can be found in the area for at least ten months of the year. Some individuals have a grey colouring under their tail flukes, instead of the white pigmentation typical of other orca. The PNG orca have been observed feeding on elasmobranchs (sharks and rays) and fish. Fisheries interactions and habitat degradation could pose a threat to this population. Orca have been observed in these waters interacting with the longline fisheries. Evidence suggests that, like the orca of the Pacific Northwest, these ecotypes may occupy different habitats and feed on different prey types. Type A lives in open water and takes mainly Antarctic minke whales; Type B lives in loose pack ice and feeds on seals; Type C live in thick fast ice where it feeds on fish. 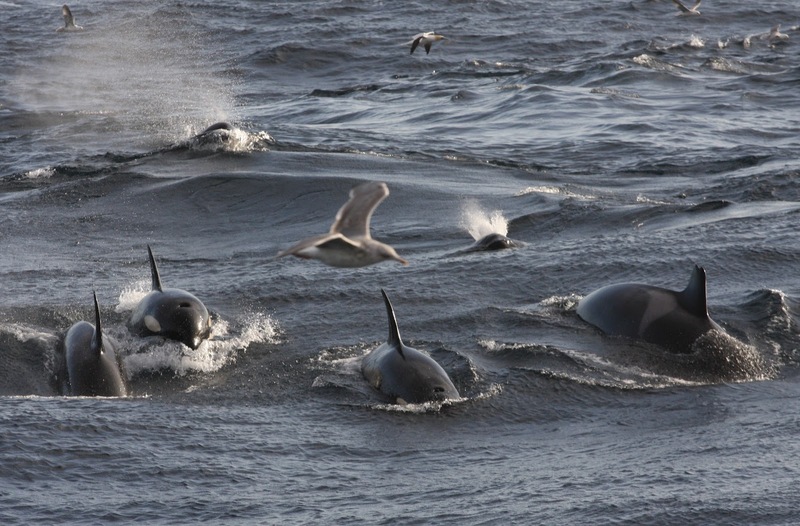 Type B orca work together in groups to create waves that wash their pinniped (seal) prey off the pack ice. Ongoing genetics research should tell us shortly if these are in fact different species of orca. 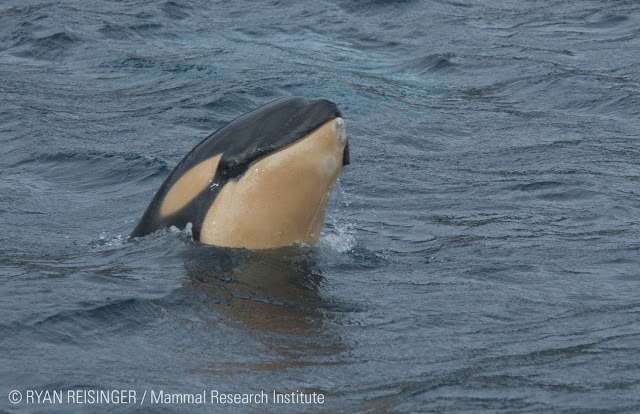 A type D orca from subantarctic waters has recently been identified based on photographs of live orca at sea and a mass killer whale stranding that occurred in New Zealand in 1955. 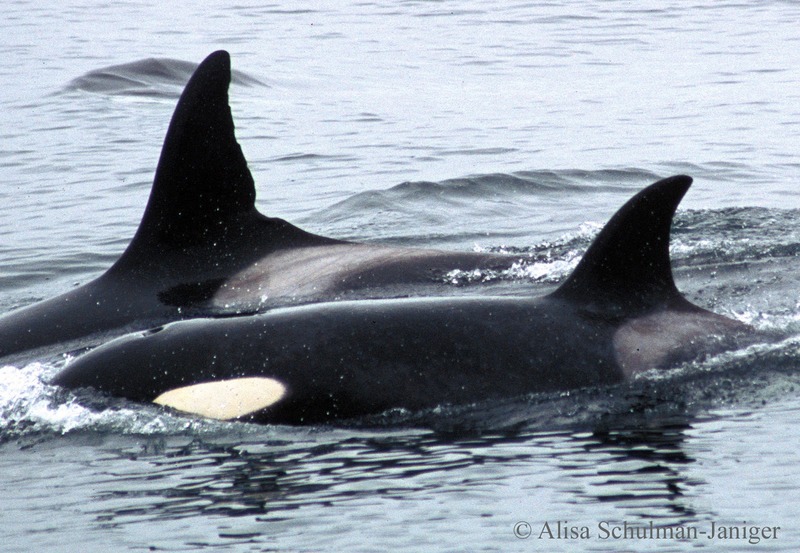 The type D orca has a very distinctive small, white eye patch. The Southwest Fisheries Science Center (SWFSC) is the research department of NOAA's (National Oceanic and Atmospheric Administration) National Marine Fisheries Service which conducts scientific research to support the management and conservation of domestic and international living marine resources. Robert Pitman and John Durban of the SWFSC are currently conducting research into the ecology and systematics of Antarctic orca. Ingrid Visser of the Orca Research Trust, along with Jo Berghan, established the Antarctic Killer Whale Identification Catalogue (AKWIC) in 2001 to help verify the different types of orca found in Antarctic waters. It was also the first collaborative effort to collate Antarctic killer whale data. Contributions to the AKWIC are solicited from scientists, naturalists, Antarctic tour operators, Officers and deck-crews of ships, helicopter and fixed wing pilots, tourists and other visitors to the Antarctic region (as well as data from adjacent waters, including subantarctic Islands). Wow - what a journey that was! We have included an estimated total of 35 - 40 distinct orca populations from around the world. 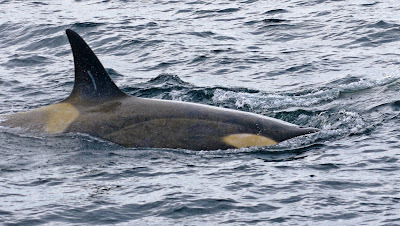 We hope that this has helped to place Orcinus orca into a wider context and that it has really painted an enormous picture which gives you an idea of how complex this species really is. They may be black and white in colour, but that is where the simplicity ends. 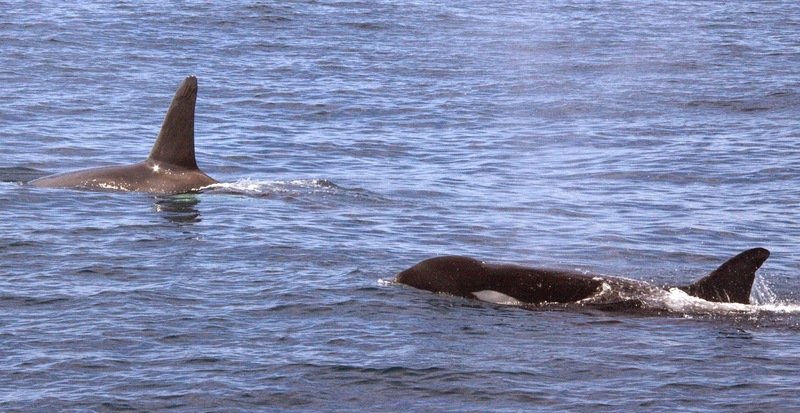 Who are these mysterious offshore orca? Where do offshore ecotypes go when they aren't visiting inshore waters? Where did California's LA pod go - was it really to South American waters? Are there orca living off the coast of European countries that we haven't mentioned here? Is there anything that we can do to help reduce the negative effects that PCBs and other toxin contamination has on orca, both in waters around the UK and in other oceans around the world? How many distinct populations frequent the waters around South America? 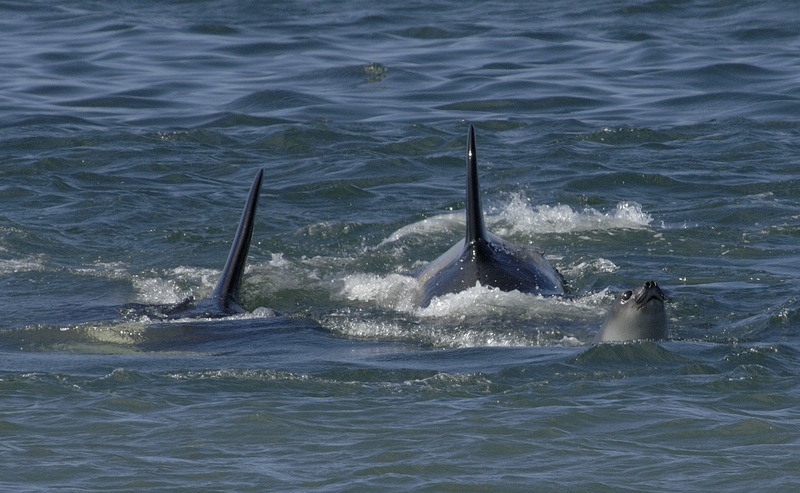 Orca are occasionally sighted off the coast of South Africa - are these orca from the Marion and Crozet Islands? Orca found in waters around the Palau Islands, Java and in the Timor and Banda Seas, as well as around the Maldives and Chagos Islands - are these orca from Australia and New Zealand? Where do Australian orca go when they aren't in Australian waters? How far do the Antarctic orca really travel? The questions really are endless - but these ones have particularly stuck out. It just highlights how much we don't yet know about these incredible individuals. Whilst our knowledge has come a long way in such a short time, we really have uncovered only the very tip of the iceberg. Many thanks go to Claire Stares and everyone who contributed to this blog report in any way - the list is too long to mention everyone by name, but you know who you are. Your time, help, insight edits and photographs have been very much appreciated! The copyright © of this blog report belongs to Orca Aware, as does all content unless clearly stated otherwise. Hucke-Gaete (2004) Operational interactions of sperm whales and killer whales with the Patagonian toothfish industrial fishery off southern Chile. CCAMLR Science 11 pp. 127-140. May-Collado et al. (2005) Patterns of cetacean sighting distribution in the Pacific Exclusive Economic Zone of Costa Rica based on data collected from 1979-2001. Revista de Biologia Tropical 53 pp. 249-263. Merlen (1999) The orca in Galapagos: 135 sightings. Noticias de Galapagos 60 pp. 2-8. Santos & Netto (2005) Killer Whale (Orcinus orca) predation on a franciscana dolphin (Pontoporia blainvillei) in Brazilian waters. Latin American Journal of Aquatic Mammals 4(1) pp. 69-72. Rosa & Secchi (2007) Killer whale (Orcinus orca) interactions with the tuna and swordfish longline fishery off southern and south-eastern Brazil: a comparison with shark interactions. Journal of the Marine Biological Association of the United Kingdom 87 pp. 135-140. Moore et al. (1999) Relative abundance of large whales around South Georgia (1979-1998). Marine Mammal Science 15(4) pp. 1287-1302. 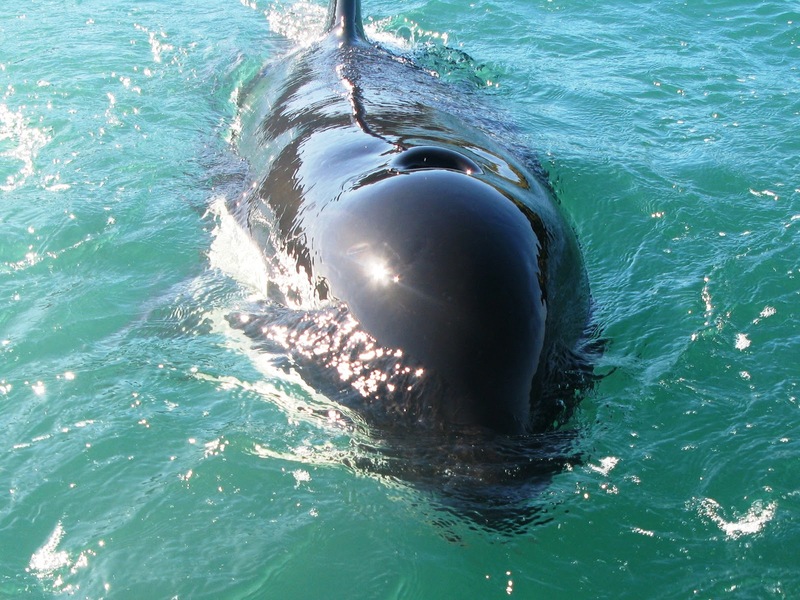 Visser - Killer whales in New Zealand waters: Status and distribution with comments on foraging. SC/59/SM19, Orca Research Trust. Visser (1997) Killer whales in Papua New Guinea waters. SC/59/SM20, Orca Research Trust. Pitman, R.L. & Durban, J.W. 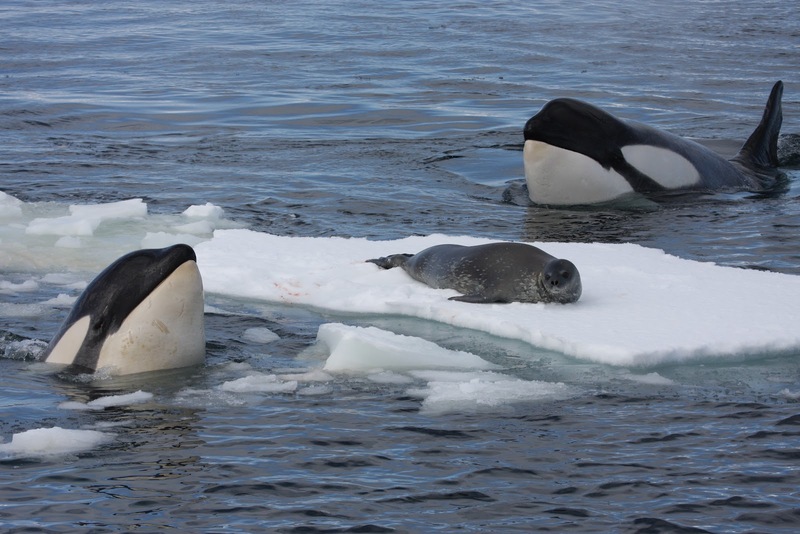 (2012) Cooperative hunting behavior, prey selectivity and prey handling by pack ice killer whales (Orcinus orca), type B, in Antarctic Peninsula waters. Marine Mammal Science 28(1) pp. 16-36. Visser et al. 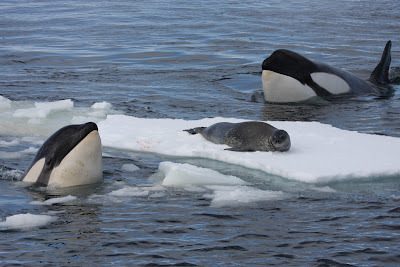 (2008) Antarctic Peninsula killer whales (Orcinus orca) hunt seals and a penguin on floating ice. Marine Mammal Science 24(1) pp. 225-234. 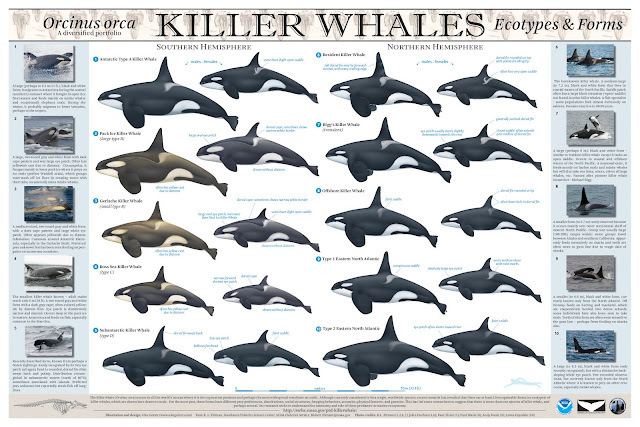 What a wonderfully informative site on killer whales! Great work, very well put together. "Dedicated to filling in the information gap on killer whale habits along the west coast from Vancouver Island to Monterey Bay." And the "Azorean orca", very rare visitors but they do come here as well. And when they do, we get great (wild and true) shows! Fascinating and informative site! The first of it's kind (that I have found) to provide global information on the different species populations and present it centrally. Thanks for the info and cheers to uncovering more mysteries behind the orca!